CSHL’s Jason Sheltzer and colleagues discovered that having one extra chromosome caused an anti-tumorigenic effect in pre-malignant cells. Subsequent research revealed that the relation between aneuploidy and cancer is more complicated than previously believed. 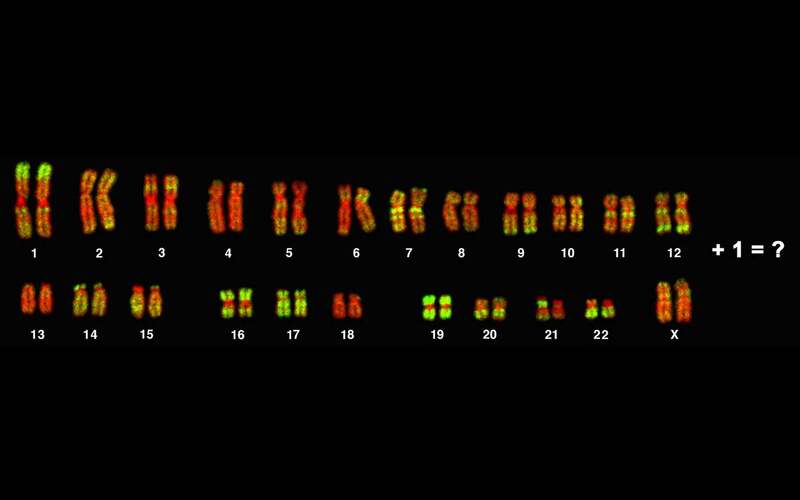 Researchers discovered that the chromosome instability that accompanies having an extra chromosome causes some cells to evolve in ways that enhance their ability to survive, yet also causes them to acquire pro-cancer features. Cold Spring Harbor, NY — Over a century ago, a German-born scientist experimenting with impregnated sea urchin eggs had an insight that led to one of the first modern theories of cancer. Theodor Boveri linked incorrect chromosome number in urchin embryos with abnormal development. In 1902 he reasoned that having the wrong number of chromosomes could cause cells to grow uncontrollably and become the seeds of cancerous tumors. Today in the journal Cancer Cell, Cold Spring Harbor Laboratory (CSHL) Fellow Jason Sheltzer, Ph.D., and colleagues at CSHL and MIT report surprising results of experiments intended to explore the consequences of having too many or too few chromosomes, a phenomenon that biologists call aneuploidy (AN-you-ploid-ee). Ever since Boveri’s era, it’s been known that cells in most cancers—90% of solid tumors and 75% of blood cancers—have abnormal chromosome numbers. (Most human cells normally have 46 chromosomes: two sets of 23, one set inherited from each parent.) The newly published experiments suggest the relation between aneuploidy and cancer is more complex than previously believed. Sheltzer, who began his project in the laboratory of Dr. Angelika Amon at MIT and carried it to conclusion in his own research group at CSHL, placed two sets of otherwise identical cells in culture dishes, side by side. One set consisted of cells with normal chromosome number; the other set, cells with a single extra chromosome. They observed that cells in the aneuploid set grew much more slowly. This was all the more perplexing given that both sets of cells had been primed for cancerous transformation, via the activation of cancer-promoting genes called oncogenes. Moreover, when the pre-malignant aneuploid cells were injected into rodents, they consistently formed smaller tumors than the pre-malignant cells with normal chromosome numbers. If having one extra chromosome caused an anti-tumorigenic effect in pre-malignant cells, then perhaps aneuploidy was not, in itself, a direct cause of cancer. This raised an obvious question, however: why are human cancer cells overwhelmingly aneuploid? More experiments led the researchers to a new hypothesis: that the chromosome instability that unquestionably accompanies having an extra chromosome causes some cells to evolve in ways that enhance their ability to survive, and also causes them to acquire pro-cancer features. This is what the team observed in some of their cultured aneuploid cells. “We noticed that the aneuploid cells would start out growing very poorly. But then, in some cases, if we left them alone for a few weeks, something would happen and overnight they would begin growing much, much more rapidly,” Sheltzer says. This phenomenon almost never happened in sets of control cells that were pre-malignant but still had a normal chromosome number. “But in the cells that started out aneuploid—with a single extra chromosome—these cells now exhibited different aneuploidy once their rapid growth spurt began,” Sheltzer says. Some lost the extra chromosome they originally had, but added one or more others. Others gained or lost whole chromosomes, but gained or lost fractions of other chromosomes. In short, the suddenly awakened cells displayed massive genomic instability, quite beyond their simple aneuploid condition at the start of the experiments. Sheltzer’s team proposes that these cells rapidly evolved to acquire different mutations that would confer a survival benefit—perhaps enabling them to grow in new environments, just as cancer cells that become metastatic evolve so as to be able to detach from their tissue of origin and grow at different sites in the body. “We think this rapid evolution could allow the aneuploid cells to acquire some of the pro-cancer characteristics that might promote cancer development or cause a cancer in a person to proliferate,” Sheltzer says. Partly based on his MIT Ph.D. thesis research performed in yeast, Sheltzer suspects aneuploidy causes errors in DNA replication, as well as problems with chromosome segregation during cell division. The accumulation of such problems over time, he says, may be triggering the inflection point in the aneuploid cells’ growth that his team reports in the experiments published today. Having an irregular number of chromosomes, almost by definition, leads to imbalances in the numbers of proteins expressed in aneuploid cells. In this respect, the new work echoes the speculation by Boveri over a century ago linking abnormal chromosome number with an imbalance between pro- and anti-proliferative signals in cells. Sheltzer will continue to explore the evolution of aneuploid cells, including the question of whether the rapid evolution seen in pre-malignant cells might account for their subsequent ability to resist chemotherapy. The research described here was supported by: National Institute of Health GM056800 and the Kathy and the Curt Marble Cancer Research Fund; Whitaker Health Sciences Fund Fellowship; MIT School of Science Fellowship in Cancer Research.